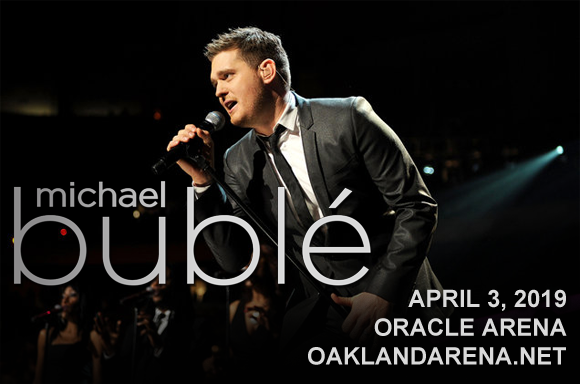 Grammy Award-winning crooner Michael Buble comes to Oracle Arena on Wednesday 3rd April 2019 for a very special evening! The singer, who recently put to bed rumors of his retirement from music, will be back on stage for the first time in two years, performing brand new material from his latest album, Love! Expect to be charmed, "wowed" and thoroughly entertained! Winner of four Grammy Awards and multiple Juno Awards, Canadian singer, songwriter, actor and record producer Michael Bublé has sold over 75 million records worldwide to date. Bublé's journey to fame has taken an unusual path: he spent a few years singing in nightclubs as a teenager and at the age of eighteen entered and won a local singing contest, before being disqualified for being under age. This lead to a management contract with the contest organizer Bev Delich, who represented him for the next seven years through jobs in clubs, conventions, cruise ships, hotel lounges, shopping malls, and talent shows. Later on, Bublé had a few TV acting jobs (Death Game (aka Mortal Challenge) and The X-Files) and became a regular performer on Vicki Gabereau's national talk show on the CTV network by accident – Bublé filled in last minute for another guest in the first season and was subsequently invited back several times. During the late 1990s/early 2000s, Bublé independently released three albums: First Dance, 1996; Babalu, 2001; Dream, 2002, but his career breakthrough came in 2000 after an unexpected sequence of events. After hearing Bublé perform at a business function, aid to the Prime Minister at the time, Michael McSweeney, bought a copy of one of Bublé's independent albums and ended up showing it to the Prime Minister and his wife who, in turn, invited him to sing at their daughter's wedding. When he was at the wedding, Bublé was introduced to multi-Grammy Award-winning producer David Foster (Madonna, Brandy Norwood, Whitney Houston, Michael Jackson, Céline Dion, Barbra Streisand, Kenny G, Cher, Josh Groban, and Andrea Bocelli), who eventually signed him to his label, 143 Records. Since then, Bublé has released eight studio albums, including three consecutive Billboard 200 number-ones. His most recent album is 2018's Love.